But before we take a look at all the teams who have made it through to the semi finals, I would like to take this opportunity to thank all junior comp players and parents for another wonderful season of tennis representing our club. 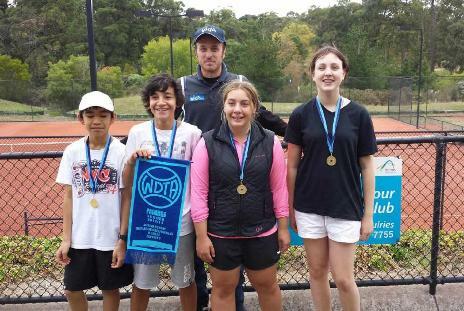 16 teams took to the courts in the Waverley & District winter competition, which was one of the most ever by Glen Iris Valley. Another record has been smashed……the amount of teams to make the finals. A staggering 12 out of the 16 teams are in the semi final with one of them already qualifying for the Grand Final. It has been a super effort by all the players. D Grade 7 team: who have already qualified for the Grand Final: Joshua Jansen, Michael Ball, Charlotte Hall and Sebastian Johannesen. All 3 D Special 1 teams who have amazingly all qualified for the finals in a 8 team section. Well done to the following players on another great season and we look forward to the summer: Jessica Vicino, Alisia Aloisi, Ella Wallace, Katia Aloisi, Stefan Tikellis, Oliver Chen, Matthew Lucarelli, George Tikellis, Lara Cunningham, Anthony Atherinos, Tony Ng and Angelique Dayandas. I wish all the teams the best of luck in the semi finals this week and hopefully the record of 3 premierships in one season can be broken in the next couple of weeks!! !